With all the mounts options for the many applications from street stock to drag racing it wa time to work up a matrix based on experience of what works where. Hopefully this helps you get the right mounts for the best experience possible. This entry was posted on Tuesday, January 25th, 2011 at 10.03 am and is filed under HowTo, Powertrain. You can follow any responses to this entry through the RSS 2.0 feed. You can leave a response, or trackback from your own site. Thank you for putting this together. I am a bit confused about what you are referring to as “Rear Diesel”. I do not see this mount for sale on your catalog page. Where would I acquire this “Rear Diesel” mount? Also, When you mark something as “Optional”, I am assuming that there is very little effect on Noise, Vibration, and Harshness of the ride. Would this be a fair assumption? This is all for a 2000 9-3 Base model driven by a lead-foot. Everything is stock, but I am considering upgrading the downpipe and the exhaust, but there are no real plans to take it to Stage 1 or whatever. I just want a sporty, durable, daily driver that is fairly responsive when I step on it. I am also eager to improve the shifting action as this car has always shifted rather slowly. 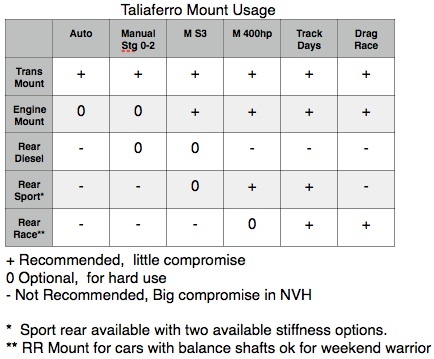 Would upgrading the mounts with what you have marked as both recommended and optional for the Stage 0 column achieve this? @Michael, With that Setup just run the Trans mount. The others would be overkill. Spend that instead on handling or HP. Thanks for clarifying that Nick! I’m a bit unsure what to choose. I’m planning to install a gt28rs in my ng-900, and dont know what power to expect, and what mounts to use. I think i will do the trans and engine mount, if thats not a big sacrifice in vibrations. But should i run the original rear? Or the diesel or sport mount? Are there much difference in diesel and sport rear mounts? Christian, 28RS is just like a stock turbo lots of torque in the midrange. So you need solid mounts to accommodate that and careful mapping to keep the torque reasonable. Keep it under 350 ftlbs at the wheels and a stg3 mount setup and stg1 disk will be perfect. Above that and you start needing lots of other upgrades. Yeah, i was hoping to keep some driveability. But also using the turbo’s full potential. Don’t know what that is tough. Will convert to 2.3L, and the turbo is 2060rs 0.86ar. What figures could i expect if maxing out? And what upgrades are you thinking about? As for clutch, i was thinking maybe Stg2? And i have to change all engine mounts, so dont if i should use original or diesel rear mount..